If you don't mind me for asking, but have you ever taken drugs before? You know what I mean by this, right? The old nose candy. The fizzy pick me up. Baby formula gone wild. Monkey-dust mark-ten. What? You don't know what I mean? Oh! Me neither. I think it best that we ask Director: Matthew Vaughn; and Actors: Daniel Craig, Dexter Fletcher, Sienna Miller and Michael Gambon. But only in the year 2004, and for 104-minutes. 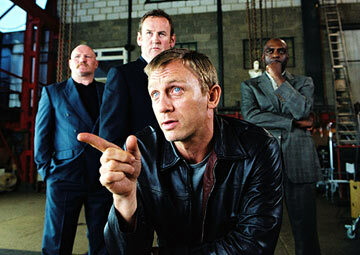 Now it is pretty safe to say that high-class crime-lord, Jimmy Price (Kenneth Cranham), has instructed business-mined drug-dealer, XXXX (Daniel Craig), to resolve two very different problems for him. OK, so on a surface level the first problem does appear like an easy thing for him to accomplish - find the drug-taking daughter of crime boss, Eddie Temple (Michael Gambon). However, when XXXX gets his ally, Cody (Dexter Fletcher), to track her down, he ends up discovering that the silly little b*tchs boyfriend has overdosed on heroin, whilst she has run off to pastures new. Ouch! Pretty bleak set of circumstances, I am sure that you will agree. And do you know what else is bleak? The second problem XXXX has to deal with as well - that's what! You see, during this time, XXXX and two of his other allies, Gene and Morty (Colm Meaney and George Harris), were supposed to sell some ecstasy tablets to some surly Scouse gangsters from up North, that wannabe hoodlum, the Duke (Jamie Foreman), acquired from Amsterdam. But no. During this transaction, the gangster inform XXXX that The Duke's tablets were stolen from a Serbian criminal, and that in retaliation he has sent out an assassin, called the Dragon, to hunt the men down associated with this deed. Worst still, is that the Duke is no where to be found! So what does XXXX do about this, huh? Turn to Morty? Because he might be able to help? No. Not really. He's just put an old friend of his in hospital, and has to lay low for awhile. OK, so what about Jimmy then? He's good with a gun? No. He does not want anything to do with this I am afraid to say. Well, what if he shags that tasty bird, Tammy (Sienna Miller), whom he met at the disco the other night? Yes - XXXX would love to do that. But unfortunately he is interrupted from getting his leg over by Eddie Temple, the father of the drug taking silly little b*tch who has run off to pastures new. Still, do you know what? The funny thing is, is that it's a good thing that Eddie has reared his head at this particular moment in time - because he does help XXXX out with a number of his problems. Firstly, he tells him that his daughter has been found, mores the pity. Secondly, he informs XXXX that Jimmy has been 'playing' him for a fool all this time, as well as stolen all of his money put from under his very nose. And thirdly, he is willing to help him out with his little ecstasy problem also. Ohh! Isn't he a nice chap? Maybe. Maybe not. Which is why what next transpires is a right pain in the crime lord I can tell you? As gangster turns on gangster - nobody loves a Liverpudlian prankster - a police ploy ends with a ting - and may long live the new King, BANG! First off, please allow me tell you what I do not like about 'Layer Cake', OK? Well, apart from the love-story in this film being more of a lust-story, I do not understand why Daniel Crag's character isn't given a name. Come on, what's the point of that, huh? What does him not having a name have to do with the story or the price of lint? Nothing, right? If the film-makers called him 'Daniel' or 'Barbra' this film would still be a really great film - so why no name? Anyway, that is my only real gripe with this movie all in all. Because by in large this movie is class in a can through and though. Here, let me tell you why: (1) All of the actors are just sublime in this flick, even the ones with lesser roles. Daniel is his macho brooding self. Michael plays the ageing crime lord to a tea. Jamie does Jamie like nobody else. It is always great to see Dexter on screen. Sienna is just breathtaking. The scousers are a treat. And as for Ken, Colm, and George? Perfect-perfect-perfect. (2) The voice-over narration is a real nice touch to this film, and enhances the overall story with some grounded personality. (3) Whenever there is an artistic piece of direction within a scene, it really does give it a very magical perspective. My favourite arty scene was just prior to the opening credits - because it did aide in introducing the character and style of this film very well. 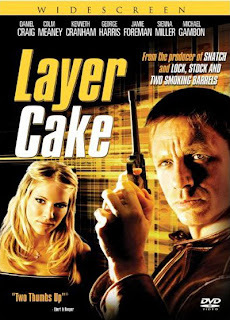 And (4) As an overall story goes, 'Layer Cake' is very novelistic in tone, and has that very earthy way of flicking back and forth between tales. For me, I thought that this was a very evolving touch, as it was able to 'flimflam' just the right number of times, without it becoming too confusing. Hey! Do you know what? While I am in a bullet-point type of a mood, let have some film facts as well, huh? (1) Daniel Crag got offered the role of James Bond on the strength of this film. (2) Guy Ritchie was offered to direct this project, but he had to drop out of it at the last minute due to a prior work commitment. (3) The word "f*ck" was said 201 times in this picture. (4) This film was adapted from a novel of the same name written by J.J. Connolly. J.J. wanted to play Luke in this film. (5) Jamie Foreman, who plays 'The Duke', is the son of notorious London mob enforcer Freddie Foreman. (6) Louis Emerick was originally going to play Morty in this flick. But the producers changed his role to Trevor because of his harsh liverpudlian accent. (7) In the bar scene, Dexter Fletcher's character, Cody, tells his partner that he is pretending to be the 'Earl of Oxford'. The director of this movie, Mathew Vaughn, would be a direct descendant to this tile, if it was not discontinued. And (8) The first draft of the screenplay was 408 pages long. The book on which it was based on is 344 pages long. Well, if you have not guessed by now, I really do love 'Layer Cake' - both the film and the desert based snack. Honestly, it's up there with all of the other great British gangster flicks of recent decades, like 'Lock, Stock and Two Smoking Barrels' (click here for review), plus 'The Long Good Friday'. Moreover, there is an edge to this movie which I feel puts it on a similar level to something like 'Smokin Aces' (click here for review), just with a more Anglo Saxon take on this particular subject matter. Now if you just think about it for a moment or two - these two films do relay similar slanted tales about the follies of following in the gangster mould. Do onto others as they will do unto you - correct guys? Alright then, f*ck off you James Bond git.